Airplane pilots have countless details to be aware of and pay attention to – as well as any number of distractions. One such challenge is fighting the bright blue sky and puffy white clouds over a period of time. What those of us on the ground consider beautiful, pilots must treat as a potential hazard. It was exactly this challenge that brought U.S. Army Air Corps Lt. General John MacCready to Rochester, New York based Bausch & Lomb in 1926. His challenge for the medical equipment manufacturer was to develop some form of eye wear which would combat the sky’s glare. In 1936, Bausch & Lomb introduced a product they called Aviator sunglasses. The glasses, featuring special green lenses, successfully met the challenge set forth by MacCready. They cut out the glare without obscuring the pilot’s vision. The following year, Aviators were introduced to the public – the original frames having been remodeled from plastic to metal frames. The new look glasses were also given a brand name all their own – Ray-Ban® Aviators. The brand name came from its purpose – Ray-Bans were created to ban the sun’s rays. The Aviators found great interest from the public when, in 1938′ the glasses were made available for consumer purchase. In particular, the glasses were a huge hit with people with an outdoors life style. This expanded demographic led to the development of the Ray-Ban Shooter – sunglasses with an amber hue which would reduce blue light and offer greater clarity. World War II saw an innovation – the gradient mirror lens. The Aviators received an enormous boost in awareness and popularity when General Douglas MacArthur was photographed wearing a pair while setting foot in the Philippines. It’s hard to say if the Aviators were deemed cool because they were the choice of pilots – or if the pilots were considered cool because they wore the sunglasses – regardless the look began to really catch fire with the public. The Aviators had transitioned from a military asset to an element of pop culture. 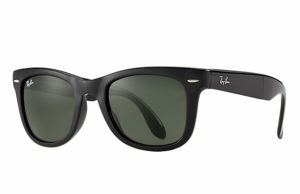 The public’s love of Ray-Ban escalated once again with the introduction of the Ray-Ban Wayfarer in 1952. That style was an instant hit in Hollywood. Mega-stars were seen wearing them in public and in their films. The impact of Wayfarers being worn by James Dean in 1955’s Rebel Without a Cause and later on by Audrey Hepburn in 1961’s Breakfast at Tiffany’s is immeasurable. Bausch & Lomb’s Ray-Ban brand would enjoy great success for the most part over the next forty years. Over sixty styles were introduced to meet changing tastes and fashions through the 1960’s and 1970’s. Ray-Ban’s luxury status was reinforced by the diverse product line, by the quality of the glasses and their cases. The celebrity culture of the brand was reinforced when featured in more popular movies including The Blues Brothers (1980) and Risky Business (1983). The 1986 release of Top Gun rejuvenated the original Aviator model. By the end of the century however, the brand had been allowed to lose its luxury status. Ray-Ban sales suffered from diminished quality which led to cheap pricing and low image retail outlets. The brand was gasping to survive. Enter Italy’s Luxottica Group – the world’s largest manufacturer and distributor of eye wear in the world. They purchased the brand for $640 million with a goal of revitalizing the brand – returning it to its previous status as a luxury brand – an accomplishment rarely, if ever, achieved. Luxottica initiated a bold plan to turn around the Ray-Ban brand. They restored high production standards, eliminated sales from 13,000 undesirable retail outlets such as gas stations, and re-established luxury-level pricing. In 2000, Ray-Ban represented 10% of Luxottica Group sales. By 2014, sales of Ray-Ban represented over 27% of sales. Further, Ray-Ban was incorporated into the company’s prescription lens business, opening an entirely new market for the iconic brand. The optical business tends to have higher pricing and higher margins. 2013 saw the introduction of a new program, Re-Mix, which allows customers to create personalized glasses. With over 220,000 different combinations of frames, materials and styles, this new program represents nearly 40% of Ray-Ban’s online sales. Company owned retail stores add to the ability to further manage the brand’s luxury status. Plans to introduce Ray-Ban into China, represent yet another tremendous sales opportunity for the brand. Ray-Ban was built into a fearless brand – was allowed to slip nearly into oblivion – and then, against all odds, was rejuvenated to fearless brand status once again. The Ray-Ban story provides tremendous insights into what’s necessary to establish – and maintain – brand value. Exceptional value yields extraordinary results – Whether it is created by design (military use Aviators) or through serendipity (pop culture status) – delivering great brand value yields higher pricing, greater consumer loyalty and a distinct market advantage. Because of that, your brand is your greatest asset. Create great value, leverage every advantage, enjoy phenomenal results. Branding is an ongoing process – For a myriad of reasons, the Ray-Ban brand was allowed to slip from its status of one of the most prestigious luxury brands on the market. Cost-cutting and ill-advised sales strategies undercut decades of brand equity. There was an effort to grow sales by creating an ‘accessible luxury’ brand. It’s simple, that will not work. To maintain a fearless brand – one which appeals to customer aspirations, you have to be diligent. It takes a long time to create value – but it can be lost in a flash. Restoring a brand to luxury status is a long-shot at best – Once a brand’s value is diminished, it’s next to impossible to restore. However, Ray-Ban, under Luxoticca Group’s direction, was able to do just that. For that, they deserve tremendous branding praise (yes, there is such a thing :)). Had Ray-Ban not maintained a high degree of brand credibility – had Luxottica not been such a powerhouse in the eyewear industry – chances are Ray-Ban’s would be selling for $9.99 at the local truck stop. Don’t take your brand for granted. Maintaining a powerful brand is a much wiser and a more cost-effective path to continued sales and profits. Ray-Ban’s are cool. The brand’s future is very bright. That’s because the brand was built on solid branding principles. It was resurrected by implementing the same strategy. Be smart when building your fearless brand. Create exceptional value. Appreciate the extraordinary results which follow.